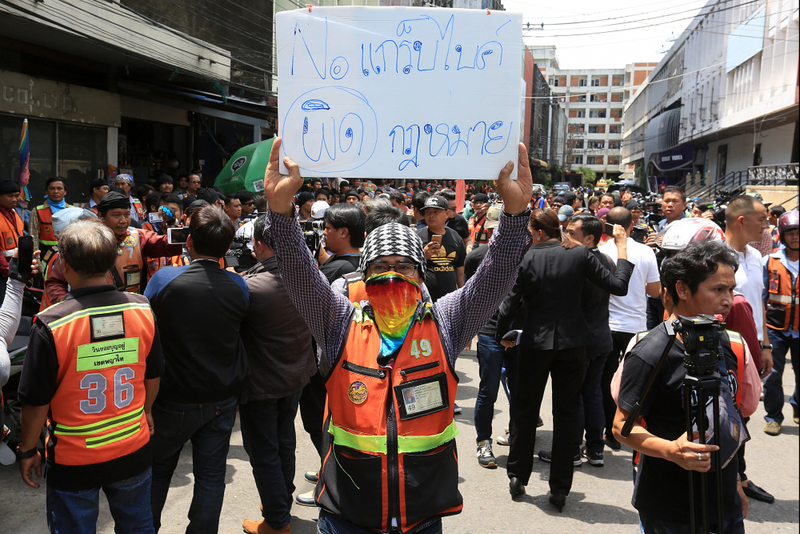 BANGKOK - Motorcyle taxi drivers on Thursday morning held a protest in front of the Grab Thailand office, calling on the company to stop owners of motorcycles with white licence plates from providing rides via the Grab app, as ordered by the Internal Security Operations Command’s (Isoc) May 7 instruction to the firm. Santi Patipanrat, a representative of the Motorcycle Taxi Association of Bangkok, submitted his group’s petition to the Grab Thailand manager via its legal department staff in front of the Thanapoom Tower on New Phetchaburi Road. 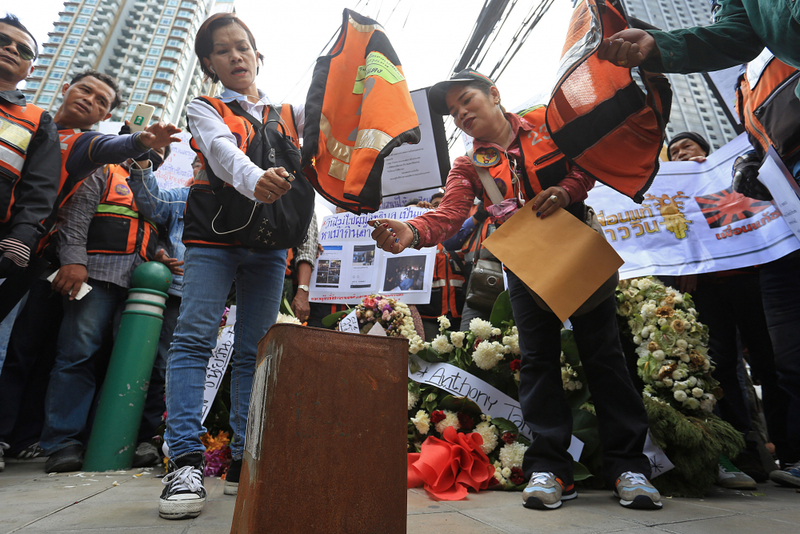 The demonstrators brought funeral wreaths with the names of Grab Thailand executives and burned a motorcycle taxi vest to symbolically express their anger. The Grab staffer told him that the petition would be passed on to the manager, Santi said. Taxi drivers said they would give Grab 15 days to respond to their demands, before going on to protest at the Land Transport Department and call on its director-general to step down over this issue, said Santi before the crowd broke up and went their separate ways. Makkasan police officers were at the site during the protest. Santi also expressed hope that the Land Transport Department would bring together all sides to discuss the problem and implement measures. “I have no problem with the Grab application, but they have to adhere to the law,” he said, suggesting the city’s more than 100,000 motorcycle taxi drivers are sufficient for providing services via Grab without also allowing illegal riders. Thailand requires that vehicles used in public transport display yellow licence plates, while members of the general public receive white licence plates for vehicles for their personal use. Grab drivers with white licence plates – who are said to offer cut-rate rides and are reportedly more convenient to hail via smartphone apps – are therefore considered unauthorised to offer the service and compete with motorcycle and automobile taxi drivers. Failing to resolve the issue could lead to more disputes and assaults or fistfights between the legal drivers and the “illegal” Grab transporters, warned Santi. He also insisted that fares for motorcycle taxi rides are regulated by the government. 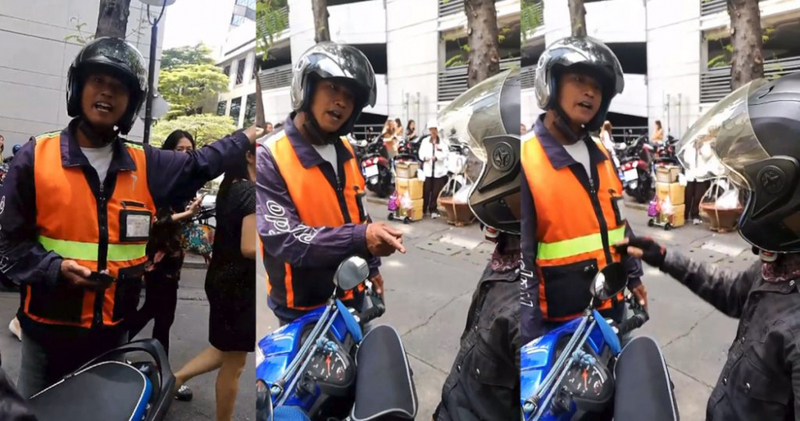 A recent confrontation was witnessed last week by a female office worker who hailed a Grab motorcyclist to take her from the Sathorn area to the Yaowarat area. A Facebook user posted about the incident along with a video clip as the Grab motorcycle on which she was riding pillion was chased and cut off by an angry motorcycle taxi rider in the Sathorn area who then scolded the Grab rider. The post asked others how much they would choose to pay for the three-kilometre ride – the traditional motorcycle’s fare of Bt120 (S$5) or the Grab motorcycle’s fare of Bt28 (S$1.17)? “Is the Bt120 fare legal? As a customer, I have the right to choose, right?” she asked.